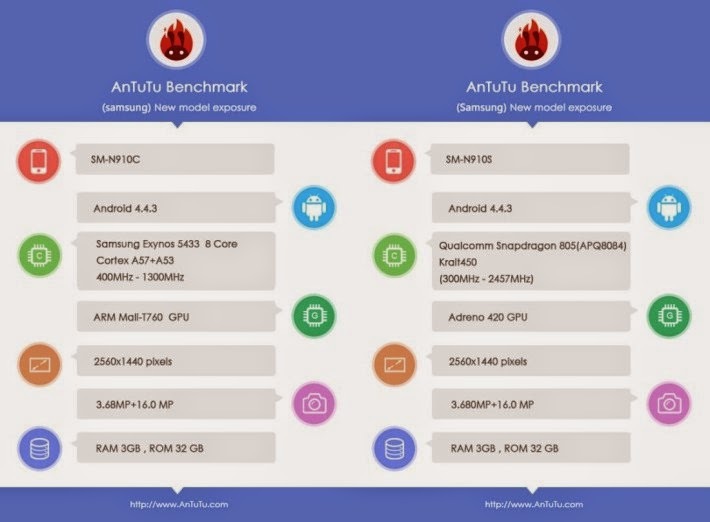 The Samsung Galaxy Note 4 has appeared in AnTuTu benchmarks. The report confirms many of the phablet's specs, including a QHD display, either an Exynos or Snapdragon 805 processor, and more. Over the last couple of weeks Samsung watched a few of its unannounced smartphones and tablets leak ahead of the official unveilings. We've been covering the just announced Samsung Galaxy Tab S 10.5 and 8.4 for a couple of months, and back in May we reported that the tablets would pack in a very high resolution and high-end 2560 x 1600 Super AMOLED display. The tablets would also ship with the fingerprint scanner Samsung had built into its flagship Galaxy S5. We've also been keeping our eye on the rumored Galaxy F / S5 Prime ever since Samsung didn't launch the 'premium' Galaxy S5 at Mobile World Congress. Samsung once again saw details of another one of its unannounced smartphones dominate tech headlines on an almost daily basis. The reports of a June release and a 2560 x 1440 QHD display turned out to be spot on. Samsung announced the Galaxy S5 LTE-A on June 18 and while it didn't feature a rumored aluminum body, it did have a gorgeous 2560 x 1440 QHD display and quad-core Qualcomm Snapdragon 805 processor and 3GB of RAM, making it have higher end specs than the Galaxy S5. This news was sure to infuriate millions of current Galaxy S5 owners, so Samsung announced that the upgraded Galaxy S5 would be exclusive in South Korea. It's now time to move on to Samsung's next highly anticipated smartphone, and that would be the Galaxy Note 4 phablet, which will be announced at IFA in Berlin in September. Expect to see Samsung Galaxy Note 4 details begin to leak at a very quick rate leading up to its September unveiling. As usual, we'll be sure to keep you updated on the Galaxy Note 4 as more details become available.